Mt. Kailash is located in the Himalayas in Western Tibet; it is a sacred site for Hindus, Buddhists, Jains and the followers of the Tibetan religion of Bon. The mount is often included in tours to Tibet for people who want to make the traditional Mt. Kailash pilgrimage and for those who want to experience the unique spirituality of the site. A typical Tibet tour which includes Mount Kailash will start in Lhasa and includes several other sites as well as the mount. A Tibet tour to Mount Kailash could include seeing the sites of Lhasa (Potala Palace, Jokhang Temple) and the nearby monasteries like Sera Monastery and Drepung Monastery before heading out towards Mount Kailash. Along the way your Tibet tour will probably include visiting Yamdrotso Lake and Lake Manasarovar which are also sacred sites. But the highlight of a Tibet tour of this kind will be when you reach Mount Kailash. It is traditional for pilgrims reaching Mt. Kailash to circumambulate (walk around) the mount, the act of completing this trek is believed to absolve the pilgrim of sins and bring him good luck. 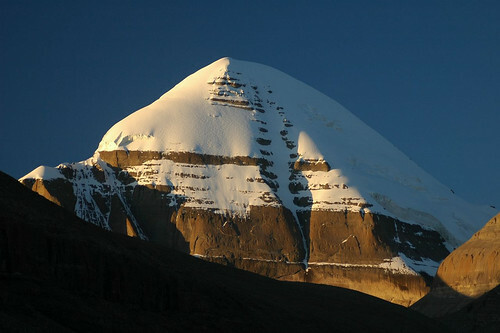 The circular trek around the mount is called the Kailash Kora. A complete circle around the base of Mount Kailash is 52km and follows a mountain stream along most of the route. The altitude of the trek varies between 4.57km above sea level and 5.18km above sea level at the Dolma-la Pass, the highest point of the route. The trek around Mt. Kailash is made in a clockwise direction by Hindus and Buddhists and in a counterclockwise direction by the Jain and Bon followers. The trek can be completed in 3 days. Along the way pilgrims and those making the trek with a Tibet tour can spend the night at Drirapuk Monastery on the first night. The first leg of the journey from Darchen to Drirapuk is 11km and tour groups use porters to carry their heavy bags on horses or yaks. After the first two hours of trekking tour groups can take a break and enjoy tea and refreshments with local nomads in a traditional nomadic tent. The second day of the trek travels from Drirapuk to Dzultripuk where you can spend the second night at the miracle cave of milarepa in a guesthouse. This is considered the hardest stretch of the trek; it covers 22km and goes through the Dolma-la Pass. Tibet tour groups and pilgrims scale the Dolma-la Pass then after taking in the breathtaking views descend a staircase to the Lhachu valley floor. Once in Dzultripuk you can visit the temple and shrine near the sacred cave. The final leg of the journey, on the third day, takes you back to Darchan and covers 11km. In Darchan there are hostels, hotels and guesthouses. Alternatively it is possible to camp out in tents. This tour experience offers the unique opportunity to experience the rugged countryside of Tibet, enjoy the breathtaking scenery and interact with locals who have come to make the sacred trek around Mount Kailash.